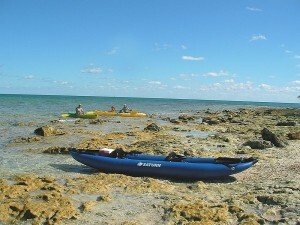 Adventuring in the Saturn Expedition Inflatable Kayak. HomeBoatsToGo - Blog About Inflatable Boats, Inflatable Rafts, Inflatable Kayaks And More...Adventuring in the Saturn Expedition Inflatable Kayak. Even though I work a fairly normal 9 to 5 job, I like to think of myself as somewhat of an adventurer. Sometimes that means using all my vacation time on travel so I can explore rivers that run through tropical settings or a backwoods wilderness. Sometimes that means traversing the nearby Florida Everglades for a weekend of camping. And sometimes that just means waking up before sunrise to get in a good morning of fishing. Whatever the case may be, the one constant in all of these adventures is the need for a great boat that I can trust. About a year ago, it was time to find a new companion to help me in my travels. After an extensive search where I took many things into account, I settled on the perfect boat for me. I chose the Saturn 13’ Expedition Inflatable Kayak, and I haven’t regretted it for even a minute. Here are some things that led me to decide to go with this great, inflatable kayak as my new boat. 1. The Saturn 13’ Expedition Inflatable Kayak is unbelievably versatile. From exploring hidden spots throughout the globe, to stand-up fly fishing in the stream behind your house, this boat can do it all. The unique design allows it to keep its balance in all conditions, while still fitting into small spaces where most other boats could never enter. That allows for all different types of adventures without ever having to change vessels. You can even easily add or remove 2 thwarts for back support while you paddle. And if you like to go fast, this inflatable boat’s streamlined design gives it more speed than you would ever imagine. 2. The affordable price. In almost every purchase we make, price is a factor. And even though boating is my favorite hobby, I still had to work on somewhat of a budget when I chose my latest vessel. My biggest decision came down to inflatable or hard hull, and it didn’t take very long to figure out that inflatable boats give you way more bang for your buck than comparable hard hull boats. Add that to the significant amount of money that an inflatable boat will save you on both storage and moving costs, and going with an inflatable boat was the obvious choice. 3. The extreme durability. One thing many people don’t realize about inflatable boats like the Saturn Expedition Kayak is that they can really handle a beating. Made with heavy-duty Dtex High Strength PVC Fabric coated on both sides, this boat is both abrasion resistant and puncture proof. In addition, the floor of the boat is crafted out of a high-pressure air deck that’s rigid when inflated, but can be easily rolled-up when deflated. 4. Convenient at every turn. As you just read, the Expedition Inflatable Kayak can be deflated and easily rolled-up, resulting in a boat that is extremely simple to store and move. That is especially handy when I want to bring it with me on a trip overseas for some adventuring. The boat was specifically designed to be packed into a suitcase (including the pump and paddles) that fits within all airline baggage allowances. So just pack it up, bring it to the airport, and be on your way to great adventures!